When we talk about high performance vehicles we also think about brakes like Mechanical linked Brakes, Hydraulic Brakes and Air Brakes. My article is totally related to hydraulic disc brake system which is used in Indian motorcycles. Extensive usage of Disc Brakes in Motorcycle, neglected brake service due to cost of spares, lack of knowledge about servicing and so on. 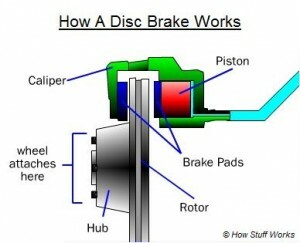 The image describes how a disc brake works. So lets not discuss about it’s working principle. But lets think about the material we use and get for that. Caliper & master cylinder we get from company is made up of aluminum and we use DOT 3 or 4 fluid for activation and so company recommends that too. DOT 3 and 4 only grades for hydraulic brakes? No, A total of four grades are available DOT 3,4,5 and 5.1. DOT 3 or 4 (Glycol Based): Maximum we use these fluids in our motorcycle. Well because we know only about those two grades and we get only these two grades. DOT 5.1 (Glycol Based): Either not available in India but this fluid has HIGH BOILING POINT and can mix with DOT3 or 4. So this is the best fluid for our units. Why we require servicing of disc brake? Well DOT 3/4 fluids are very high hygroscopic fluids (hygroscopic=which means they absorb water easily and hold it in suspension). When we apply disc brake at that time it boils at very low temp due to that it expands the internal air which is in heat expansion chamber (this chamber is in the reservoir below the master cylinder cap, and above the MAX. level of fluid) When air get heats up due to the internal temp. It also cools down. As we know when air heats up what happens to it. It becomes steam but after cooling it becomes water. As I told you before about hygroscopic characteristic of fluid means it can mix with water easily. Generally our mechanic says that the water is entering from the hole which is given for breathing purpose. But NO, that is not the only reason. Heat, cold & moisture is the reason behind all mess. The material which companies are using for caliper and master cylinder is aluminum or sort of aluminum alloy. Aluminum never get rusted but get affected by water so that shows deposition of oxidation on the surface. In the master cylinder when fluid mix with the water that affects the master cylinder body and starts the oxidation reaction. The oxidation will never mix with fluid but floats on the surface or sticks to cylinder wall or it goes to the main track till caliper. And here you feel bad brakes. First brake fluid becomes black due to temperature & operation, secondly oxidation clogs the track. Result: Bad and hard brake lever so no brake at all. So first of all service the brake system thoroughly and change the brake fluid at least 4 times in a year. The level given on the master cylinder is not to refill the fluid but that indicates the brakes pads wear and tear. So if the fluid is less then change the brake pads as fast as possible. (In the cars pad wear indication is scratchy noise made by steel plate). Fluid level will come back to normal. Brake fluid never decreases by any chance unless and until if there is any accident. But at normal usage pads start wearing. A professional rider changes brake fluid 4 times in a year. So I feel we should switch to DOT 5.1 brake fluid. Soon I will be importing this fluid for disc brake systems. Always check and clean the disc unit from professional and skilled mechanic. Do not try to attempt this at home if you are unknown to any mechanical parts. You may endanger your or others life by wrong fitments. This article is for awareness only.